Our new Titanium Pipe Shield combines the high heat tolerance of proprietary LR fiber technology with a unique rivet-based clamp-on shield design to improve heat dissipation and cooling. Where typical glass fiber shields can begin to fail at 900°F with the Mylar outer material cracking and flaking off, Titanium Pipe Shields provide heat protection up to 1350°F. Constructed using our LR fiber technology, the outer layer is made from pulverized and stranded lava rock into a proprietary tightly woven weave for durability and strength. The inside material is made of a special high temperature resistant fabric (89% silica) designed to withstand 350 degrees more heat than glass fiber material. Our proprietary fiber technology combined with a unique shield standoff bracket design provides an air gap between the shield and pipe that together provides the maximum potential for cooling and heat dissipation. 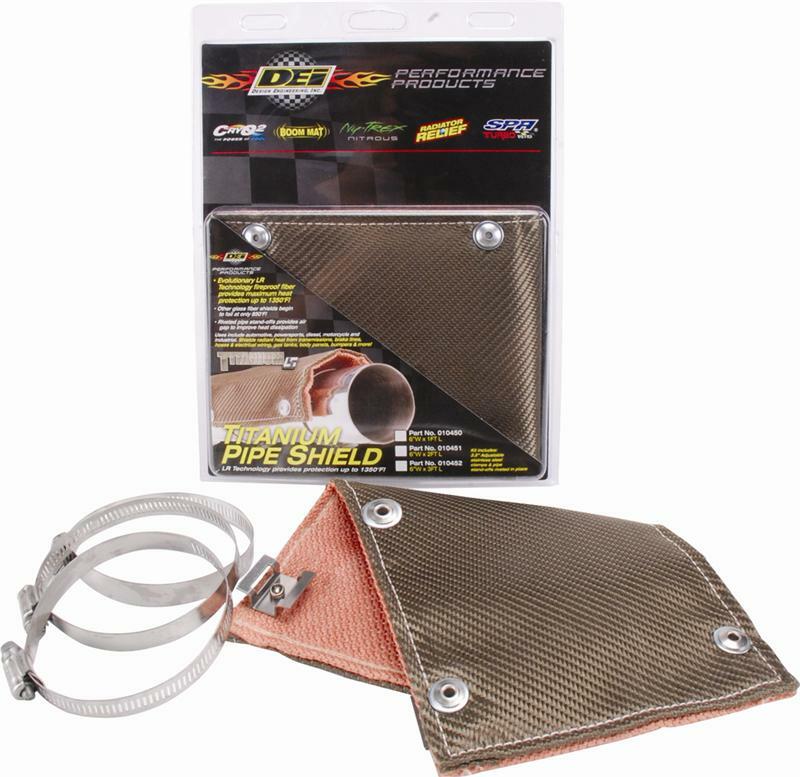 Strategically placing a Titanium Pipe Shield near transmissions, brake lines, floorboards, body panels, diesel exhaust stacks or motorcycle pipes, radiant heat can be controlled for maximum protection and performance. 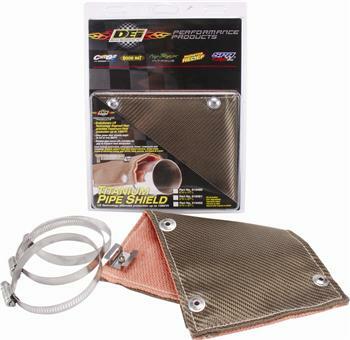 Other uses include isolated areas such as sections of the exhaust pipe after the collector, an area that can heat transmission fluid, or along the path of an exhaust system in proximity of gas tanks, differentials and rear fascia. Titanium Pipe Shields are designed for multiple automotive applications as well as marine, powersports, diesel and industrial uses where heat dissipation and thermal control is needed.